Delaware has one of the highest per-capita pedestrian fatality rates in the nation. We're working hard to change that. Preventing pedestrian crashes is easy. Using crosswalks, yielding to others, and making smart crossing decisions will reduce the number of pedestrian fatalities and injuries in the state. The Office of Highway Safety and the Delaware Department of Transportation (DelDOT) is teaming up with State and local law enforcement to educate the public about safe walking practices through the Walk Smart campaign. It involves a combination of law enforcement stopping violators and educating them about safe walking and crossing practices and public awareness activities. OHS officials say the public awareness and education is what will truly drive the success of this effort. OHS is promoting the Walk Smart campaign starting in October, 2018 and continuing throughout 2019. Across the state you will see DART bus ads, sidewalk decals, door hangers, posters, flyers, and lifeguard stand ads. OHS will produce and DelDOT will distribute sidewalk decals to towns who want to remind pedestrians to cross at marked crosswalks and intersections. 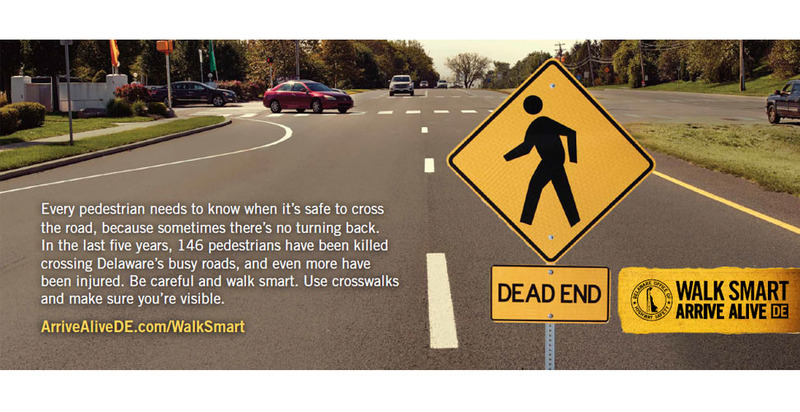 OHS will partner with towns to set up pedestrian safety checks along roadways with high pedestrian crash data to distribute pedestrian safety informational flyers that highlight safe pedestrian practices along with reflective items with the "Walk Smart" message. Don't take risks. Be a Crosswalk Champion.